Role: Chirurgeon - Dedicated Healer - In addition to the normal uses of Fate points, when a Chirurgeon character fails a test to provide First Aid, he can spend a Fate point to automatically succeed instead with the degrees of success equal to his Intelligence bonus. 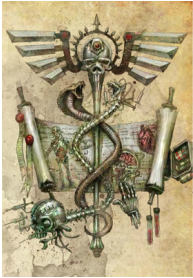 Background: Adeptus Administratum - Master of Paperwork - An Adeptus Administratum character counts the Availability of all items as one level more available (Very Rare items count as Rare, Average items count as Common, etc.). Homeworld: Ossuar (Shrine World) - Faith in the Creed - Whenever a shrine world character spends a Fate point, he rolls 1d10. On a result of 1, the character’s total number of Fate points is not reduced. Ossuar - Located in the Pollom System, the Creed of Remembrance rules Ossuar in the name of the Ecclesiarchy. A mausoleum covers much of the main continent, where several of the blessed saints who helped found Askellon are laid to rest in archaeotech stasis chambers. Flocks of attendants labour constantly here, the idea of the saints becoming exposed to time too horrible to contemplate. Many more oil the gleaming statuary and herd the many millions of faithful through the labyrinthine walkways. After spending years to reach the planet, many pilgrims perish in the additional years travelling from the outskirts to the sanctified remains within.